Venice is perhaps the most famous city in the region of Veneto, however, there are other notable cities and places such as Verona, Padova, and the breathtaking Dolomites. The first-time visitor to Venice, in the region of Veneto, arrives with a heavy freight of expectations, most of which turn out to be well founded. All the photographs you’ve seen of the Palazzo Ducale, of the Basilica di San Marco, of the palaces along the Canal Grande – they’ve simply been recording the extraordinary truth. All the bad things you’ve heard about the city turn out to be right as well. Economically and socially ossified, it is losing people by the year and plays virtually no part in the life of modern Italy. It is deluged with tourists – the annual influx exceeding Venice’s population two-hundredfold. Occasionally things get so bad that entry into the city is barred to those who haven’t already booked a room. And it is expensive – the price of a good meal almost anywhere else in Italy will get you a lousy one in Venice, and its hoteliers make the most of a situation where demand will always far outstrip supply. As soon as you begin to explore Venice, though, every day will bring its surprises, for this is an urban landscape so rich that you can’t walk for a minute without coming across something that’s worth a stop. And although it’s true that Venice can be unbearably crowded, things aren’t so bad beyond the magnetic field of San Marco and the kitsch-sellers of the vicinity, and in the off-season (October to Christmas and January to Easter) it’s even possible to have parts of the centre virtually to yourself. As for keeping your costs down, Venice has plenty of markets in addition to the celebrated Rialto, there are some good-value eating places, and you can, with planning, find a bed without spending a fortune. Tourism is far from being the only strand to the economy of the Veneto, however. The rich, flat land around the Po supports some of Italy’s most productive farms and vineyards, and industrial development around the main towns rivals even the better-known areas around Milan, making the region one of the richest in Europe. At Marghera, just over the lagoon from Venice, the Veneto has the largest industrial complex in the country, albeit one that is now in decline. But tourism is important, and the region has more tourist accommodation than any other in Italy. After Venice, it’s Padua and Verona that are the main attractions, with their masterpieces by Giotto, Donatello and Mantegna and a profusion of great buildings from Roman times to the Renaissance. None of the other towns of the Veneto can match the cultural wealth of these two former rivals to Venice, but there are nonetheless plenty of places between the plains of Polesine in the south and the mountains in the north that justify a detour – the Palladian city of Vicenza, for instance, the fortified settlements of Montagnana, Cittadella and Castelfranco, or the idyllic upland town of Asolo. 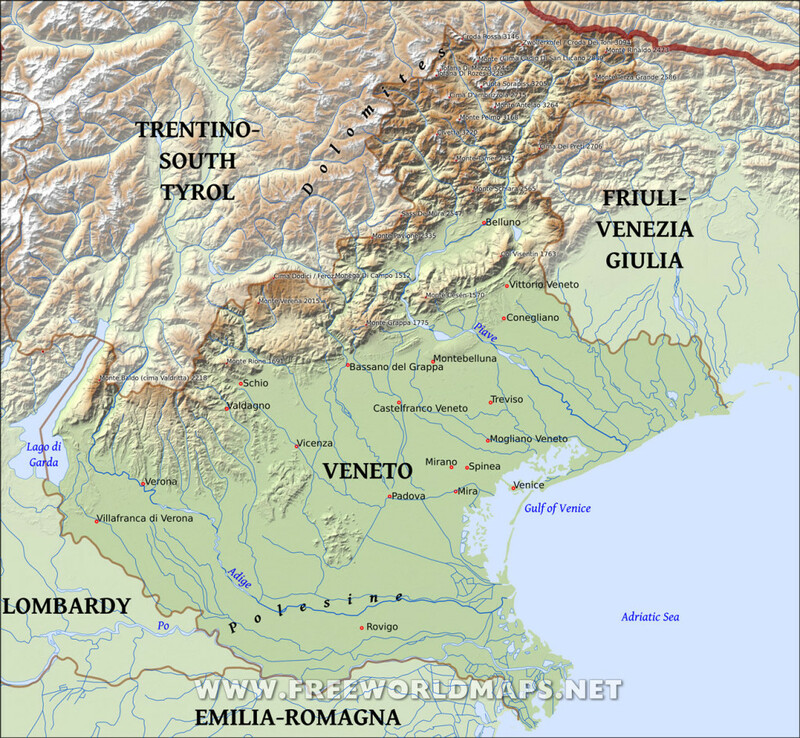 For outdoor types, much of the Veneto is dull, consisting of flatlands interrupted by gentle outcrops around Padua and Vicenza. The interesting terrain lies in its northern part, especially in the area above Belluno and Vittorio Veneto, where the wooded slopes of the foothills – excellent for walking – soon give way to the savage precipices of the eastern Dolomites. Because most of the high peaks of the Dolomites lie within Trentino-Alto Adige, and the mountains of the eastern Dolomites are most easily explored as part of a tour of the range as a whole, the area of the Veneto to the north of Belluno is covered in the “Trentino-Alto Adige” section. Similarly, the eastern shore of Lago di Garda is covered as part of the lakes region in the “Lombardy and the Lakes” section. DK Eyewitness Travel Guide: Venice and the Veneto takes you by the hand, leading you straight to the best attractions the region has to offer. The fully updated guide includes unique cutaways, floor plans, and reconstructions of Venice’s major architectural sights, plus a pull-out city map marked with attractions from the guidebook and an easy-to-use street index. DK’s insider travel tips and essential local information will help you discover the best of Venice and the Veneto, from local festivals and markets to day trips around the countryside. Detailed listings will guide you to hotels, restaurants, bars, and shops for all budgets, while transportation maps and a chart showing the walking distances between sights will help you get around the city. New itineraries based on length of stay, regional destinations, and themes. Brand-new hotel and restaurants listings including DK’s Choice recommendations. Restaurant locations plotted on redrawn area maps and listed with sights. Redesigned and refreshed interiors make the guides even easier to read. With hundreds of full-color photographs, hand-drawn illustrations, and custom maps that brighten every page, DK Eyewitness Travel Guide: Venice and the Veneto truly shows you this destination as no one else can.